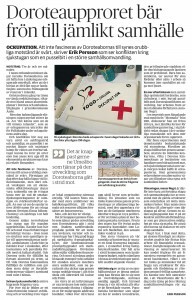 Sollefteå Maternity Care Occupation shows ways for New Social Movements (2017-02-02) is a short essay originally published in Swedish, by regional daily paper Västerbottens-Kuriren. Translated to english by the Transnational Social Strike (TSS) Network. The essay was written about a month after the Sollefteå Maternity Care Occupation began in January 2017. The occupation opposed the closing of the maternity ward as well as other cuts at the hospital. The intention with the essay was to connect the occupation as one node in a large social movement against austerity in the Västernorrland County Council which has mostly affected the hospital in Sollefteå. 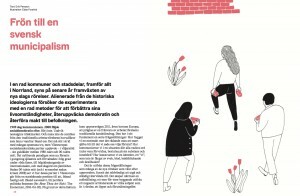 Seeds for Municipalism in Sweden (2016-05-01) was originally published in Swedish by anarchist periodical Tidningen Brand. The issue titled »The Local« made effort to critically introduce the ideas of (New) Municipalism to a Swedish speaking milieu after such actors had gained power over a multiplicity of Spanish cities in 2015 while also the Democratic Federation of Northern Syria had declared autonomy and was in the wake of experimenting with models inspired by theorist Murray Bookchin. This essay discusses similarities between such ideas and contemporary movements particularly in communities located in northern Sweden. 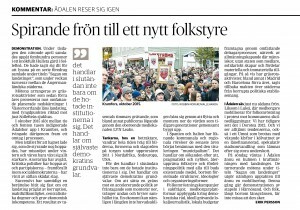 The Dorotea Insurrection Carries Seeds for an Equal Society (2015-07-24) was originally published in Swedish in regional daily paper Västerbottens-Kuriren. The Dorotea Insurrection was a struggle between 2012-2015 against county council austerity focusing on the Emergency room in the village Dorotea and the ambulance service in next-door municipality Åsele. Both villages are located in the inland parts of the Västerbotten county, which administrative center is the city Umeå, located by the coastline. The Dorotea Insurrection was notable by the inhabitants occupation of the local health center for more than 3 years, a campaign for a county council referendum on these specific cuts as well as the ousting of the social democratic party from local power in advantage for a local party called Dorotea kommunlista – the Dorotea municipal list. The cuts were in the end retracted. This essay was written as the insurrectionaries ended the occupation with the promise of developments in the inland health care. 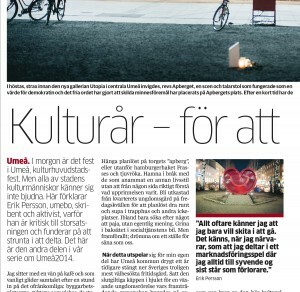 A Year of Culture – To attract investors (2014-01-30) was originally published in Swedish by southern Swedish local daily paper Kristianstadsbladet. It’s written to contrast the inauguration of Umeå, my home municipality in Northern Sweden, as the European Capital of Culture (ECoC). The essay mostly focuses on tensions between youth movements and ruling actors, but also discusses how the ECoC impacted the city and its citizens.